1. 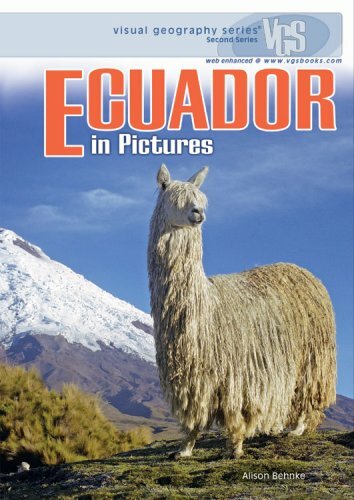 Ecuador in Pictures (Visual Geography. In 1992, Calhuasí, an isolated Andean town, got its first road. Newly connected to Ecuador’s large cities, Calhuasí experienced rapid social-spatial change, which Kate Swanson richly describes in Begging as a Path to Progress. Based on nineteen months of fieldwork, Swanson’s study pays particular attention to the ideas and practices surrounding youth. 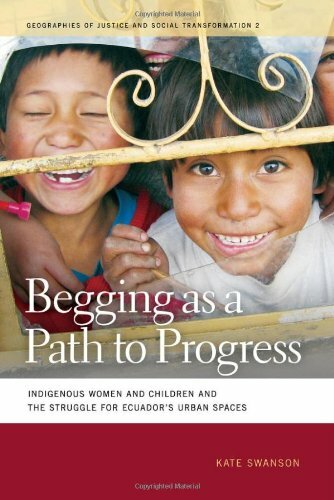 While begging seems to be inconsistent with—or even an affront to—ideas about childhood in the developed world, Swanson demonstrates that the majority of income earned from begging goes toward funding Ecuadorian children’s educations in hopes of securing more prosperous futures. Examining beggars’ organized migration networks, as well as the degree to which children can express agency and fulfill personal ambitions through begging, Swanson argues that Calhuasí’s beggars are capable of canny engagement with the forces of change. 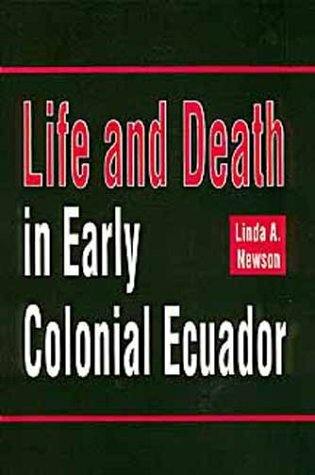 She also shows how frequent movement between rural and urban Ecuador has altered both, masculinizing the countryside and complicating the Ecuadorian conflation of whiteness and cities. 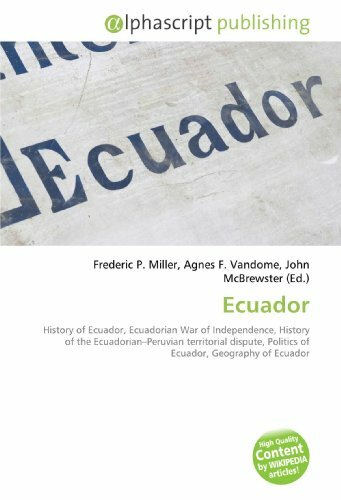 Finally, her study unpacks ongoing conflicts over programs to “clean up” Quito and other major cities, noting that revanchist efforts have had multiple effects—spurring more dangerous transnational migration, for example, while also providing some women and children with tourist-friendly local spaces in which to sell a notion of Andean authenticity. Despite intense interest in this biologically diverse and ecologically important region, the mammals of South America are still not well known. Filling a large gap in the literature, this volume provides a survey and synthesis of current knowledge of the more than 650 species of land and marine mammals found in Ecuador, Peru, Bolivia, and Brazil. Third in a series that reviewers have described as "state of the art" (Journal of Biogeography) and "invaluable to anyone interested in the mammalian fauna of the Neotropics" (Quarterly Review of Biology), this volume follows the format of its acclaimed predecessors. Chapters present not only up-to-date taxonomic information but also ecological and behavioral characteristics, conservation status, and distribution maps for most species. Numerous illustrations are provided to assist in field and laboratory identification, including exquisite color and black-and-white plates by Fiona Reid. New to this volume are chapters contributed by experts on the mammalian fossil record of this region and on its current biodiversity and biogeography. An appendix summarizes changes to the nomenclature that have altered the scientific names used in the first two volumes. Volumes 1 and 2 of Mammals of the Neotropics, which are also available, describe the mammals of Panama, Colombia, Venezuela, Guyana, Suriname, and French Guiana (volume 1) and Chile, Argentina, Uruguay, and Paraguay (volume 2). The fourth and final volume of this series will cover the mammals of Mexico and Central America. Fine addition, but you still need the other two volumes! 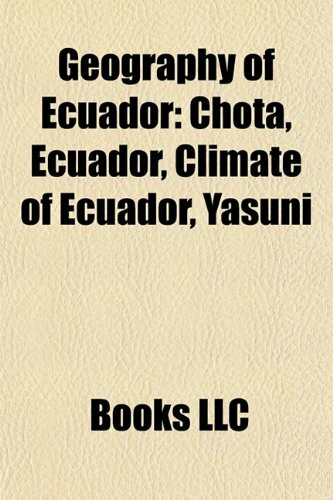 This volume provides a synthesis of knowledge and individual species accounts for the more than 650 species of land and marine mammals found in Ecuador, Peru, Bolivia, and Brazil. It is the third and final part of a trilogy that now runs to over 1400 pages. 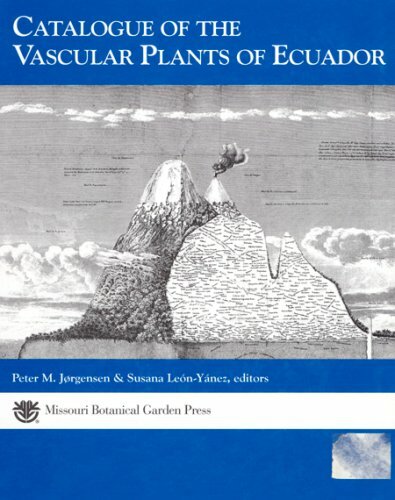 The series began with the publication of the first volume in 1989 (The northern Neotropics: Panama, Colombia, Venezuela, Guyana, Suriname, and French Guiana), authored by Eisenberg alone. He was then joined by Redford for both the second volume (1992. The southern cone: Chile, Argentina, Uruguay, and Paraguay) and now the third. 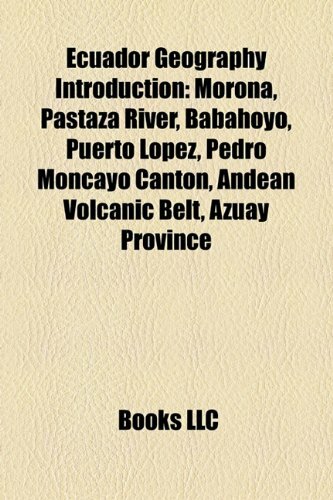 The general aim of this collection is to summarize in a single source what is known about the identity, distribution, history, and ecology of the mammalian fauna of the Neotropics. To this end, every genus and species of mammal known to occur in this biogeographic realm has been given a concise description, together with distributional maps of both known occurrences and estimated ranges. In some cases, figures of mammal parts, such as crania, and sketches and drawings of whole animals have been provided. Although the third volume features Eisenberg and Redford as the principal authors, it also includes seven stand-alone contributions. Four are from Brazilian mammalogists, on paleontology and biogeography, chiefly of Brazil. Eisenberg himself contributes two extra essays (one on mammalian biodiversity and another on distribution and history of this fauna). Webb contributes a short essay on the history of the mammalian fauna in South America (which renders it somehat redundant with Eisenberg's account). The book starts with a short introduction that inevitably has to repeat some information in earlier volumes, and makes it clear that this volume is to be used in conjunction with the others in the series. 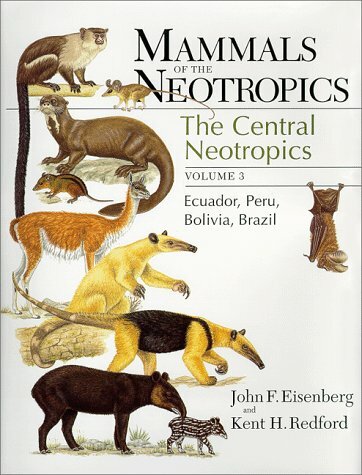 This may be a disappointment for some readers, because many mammal species found in the central Neotropics are also found in either the northern or southern regions already covered by the previous two volumes.Therefore, the authors have chosen to give more concise descriptions of"redundant" mammal species, for which finer details have to be located in the other volumes. The book itself is divided into three parts, with stand-alone contributions concentrated in Parts 1 and 3, and Part 2 being the material written by Eisenberg and Redford together. Here, 13 chapters deal separately with marsupials, edentates, insectivores, bats, primates, terrestrial carnivores, marine carnivores, whales and relatives, sea cows, odd-toed ungulates, even-toad ungulates, rodents, and rabbits. These chapters present not only taxonomic information but also ecological and behavioral characteristics, and distribution maps for most of the species. Indeed, for each species the following topics are generally addressed: Description (morphological), Range and Habitat (or Distribution), and Natural History.In some cases, there are separate sections dealing with Life History, Ecology, and miscellaneous Comments.Several tables of measurements are also found throughout the book and for some species rich groups such as bats and rodents, keys to families and genera are provided.Illustrations of crania, tooth rows, feet, and a few sketches are provided when deemed necessary by the authors, presumably as an aid in field and laboratory identification. A small number of color and black-and-white plates are grouped mid-way through the book. Each chapter and essay comes with its own bibliography, which leads to some redundancy in citations. Overall, the bibliographies are extensive, and the coverage seems exhaustive, with references updated to 1997 (it appears that the book went to press in 1998). For such an encyclopedic effort, there are remarkably few errors of fact, as far as I can judge. There are, however, some presentation problems. The most common is that of making statements and attributing them to sources that surely did not contribute such statements. Indeed, this lack of precision in citation may be an artifact resulting from Eisenberg and Redford making separate statements without specific references, and then citing a wholesale sequel of authors. Another mistake I noticed is that of citations in the bibliographies that are not found in the text. The opposite also happens, but less frequently. I also found it awkward that among the 19 plates depicting mammals, only one has a scale to gauge their absolute size. Nowhere are we told, either, if mammals grouped in a single plate are proportionally sized.I hope that this omission will be corrected in future editions. Inevitably for a work of this length and complexity, there are typographic errors.Many are found in the literature cited, more commonly in citations made in languages other than English. I did not detect taxonomic errors, but I am not a systematist. Some scientific names are misspelled (e.g., culpeus instead of culpaeus in p. 280; jabcobita instead of jacobita in Map 10.26), and some genera passed to synonymy are sometimes referred to by their old name (e.g. Dusicyon instead of Pseudalopex in p. 283). All of the above may be considered nit-picking in light of the tremendous contribution toward organizing in a trilogy all that is known on Neotropical mammals. I looked hard for weaknesses in the volume but I could only find strengths. Indeed, this volume is a first-rate capitulation and synthesis of hundreds of papers written in Spanish and Portuguese, thus rendering this wealth of information to the English-speaking readership for the first time. 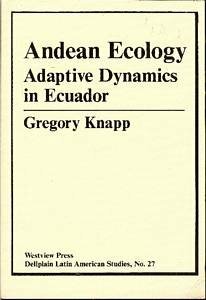 In addition, by treating comprehensively a wide swath of South America along both sides of the Equatorial line, east to west, this book provides a better understanding of the distribution of species that trespass national borders without even noticing them. In this sense, the compilation here reviewed is much more than the summation of separate national books on "The Mammals of X." It gives an overview on the way mammals "perceive" this part of the world and face threats posed by national policies on the exploitation of natural resources. I think this book (together with the two preceding volumes) fully meets its intended aim of gathering and synthesizing disperse information, and delivers even more in the sense of giving a broad-picture of Neotropical mammal biodiversity and biogeography. The primary readership for this book is supposed to be one of professional mammalogists worldwide. It is also a great resource for graduate students in mammalogy, and, I would add, for conservation biologists and wildlife managersin general. I think this book belongs in the personal libraries of all mammalogists interested in the Neotropics, and also in institutional libraries where students can consult it. I bought this volume first and should have thought of it but I didn't ... since the central neotropics have many of the animals of the northern and the southern areas of the continent, many animals are only covered in shorthand style in this volume, as they've already been described in the other two volumes. The relatively small number of color-plates was also a bit disappointing. Finally the size of the book (height & breadth) makes it a real challenge to take with you on a field trip. The information on species that *are* described in detail in this volume, however, is excellent. Distribution maps, behavior, detailed measurements, anatomical details and lots of references to source literature make it a joy to read and browse through. This digital document is an article from Journal of Cultural Geography, published by JCG Press on February 1, 2009. The length of the article is 902 words. The page length shown above is based on a typical 300-word page. The article is delivered in HTML format and is available immediately after purchase. You can view it with any web browser. This digital document is an article from Focus on Geography, published by American Geographical Society on September 22, 2009. The length of the article is 1153 words. The page length shown above is based on a typical 300-word page. The article is delivered in HTML format and is available immediately after purchase. You can view it with any web browser. Title: Response to Maria Fadiman.